In Africa, you can stay at different types of accommodation, such as wild camps or lodges in or by Africa’s famous national parks, at fabulous resorts right on the beach or in great hotels in the big cities. Your accommodation options depend on where you are travelling to and the purpose of your visit (safari, mountain climbing or beach holiday). On most of our tours to Africa you may find several different types of accommodation. Click on each destination below to find out what accommodation options we offer at our destinations. Wild camps are typically located right on the edge of or directly inside one of Africa’s major national parks. The accommodation here is full-height tents with solid floors. The tents also have a shower and a toilet. When you stay at wild camps, you get right up close to nature, making them a great way to experience Africa and the savannah wildlife. 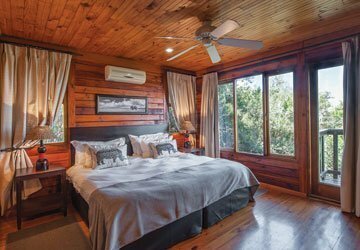 Lodges are cabins of varying sizes. They often have pools, restaurants and other fabulous facilities. Our lodges afford stunning views over one of Africa’s stunning national parks, and the scenic, lush surroundings often attract the animals of the savannah. Lodges therefore offer both a high level of comfort and experiences. At some of the destinations and in the big cities, you stay at modern hotels, e.g. in Nairobi, Dubai and in Cape Town. The hotels have everything you need, typically both restaurants and pools. What’s more, they are perfectly located for exploring the cities. You will typically find our beach resorts when you round off your tour with a beach holiday in Mombasa, Mauritius or Zanzibar, for example. All resorts enjoy a wonderful location, right on fabulous, white sandy beaches. At our beach resorts, you can completely unwind and experience a high level of service, great facilities, beautiful surroundings and the option of plenty of activities. Any questions about the accommodation? 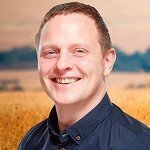 If you have any questions about our accommodation options in Africa in general, or about a specific destination, please feel free to contact us. Our travel consultants are on hand to help you on your way to the holiday of your lifetime. Our slogan is “Get even closer”, and when you travel with Africasafari.co.uk, you get right up close to the animals, the nature and the amazing experiences. Get up close to Tanzania’s unique nature and animal life and see huge animal herds as you visit several of the country’s iconic national parks. 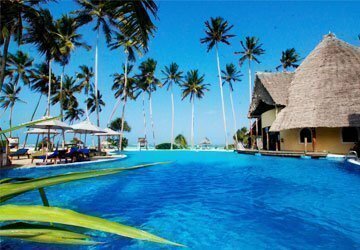 Finish your tour with a 4* beach holiday on Zanzibar. In the world-famous Kruger National Park, you find the Nkambeni Tented Camp. 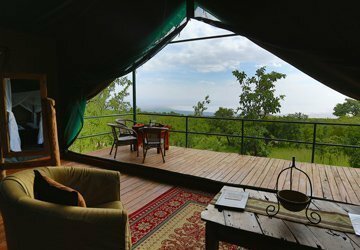 Here you stay in comfortable tents with a view of the bush and go on safari into the national park. Reach the top of beautiful Kilimanjaro on the renowned Machame route – one of the most beautiful and most popular routes with a high success rate.